Bugsby’s Way, SE10. Photo © David Secombe 2010. 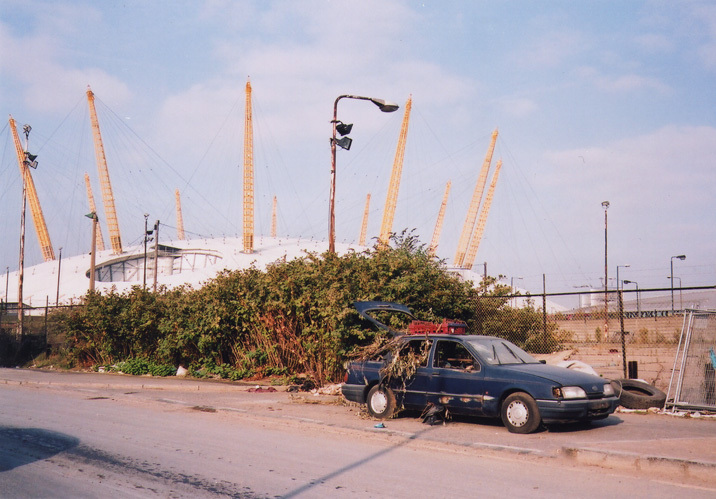 In 2006, the Millennium Dome was bought by the magnate Philip Anschutz who planned to open ‘Britain’s first Supercasino’ and an entertainment complex within it, whilst the phone company O2 paid for it to be rebranded ’The O2’. I attended Open House here in 2006, hoping to be able to see inside this fabulously enormous, hubristic space, able to fit several football pitches inside it, Canary Wharf laid flat, amongst other dubious statistical feats. The reality was rather more disappointing, as Anschutz employees showed nonplussed architecture buffs nothing but the small space where the Casino was being constructed – to no avail, as the Supercasino permission was given to New Emerging Manchester instead, until the plans for these gambling cathedrals were cancelled by Gordon Brown upon taking power. Nonetheless, the Dome was reopened in June 2006, its ceremonial opening a concert by bafflingly enduring hair metal act Bon Jovi. Around the time the Dome was reopened as the O2, the renovated Royal Festival Hall had also just opened upriver to much fanfare. This fragment of the 1951 exhibition appears as the upscale, upriver entertainment centre, with the Dome as the prolefeed easterly equivalent. Inside, the newly reopened Dome resembles an Arizona shopping mall, only sheathed in greying Teflon. The whole area is ‘themed’ in a Grand Theft Auto art deco, and I wonder what Richard Rogers and Mike Davies think about what happened to their building. A ‘chill-out zone’ consists of a tent filled with iPods. Decorated guitars and fibreglass palm trees punctuate the ‘streets’, while outside a billboard proclaims a little history of entertainment – 1951 Frank Sinatra, 1983 ‘Metallica invents Speed Metal’, 1995 Blur vs Oasis – emblazoned on a series of gurning crowds. * published by Verso. © Owen Hatherley 2010.